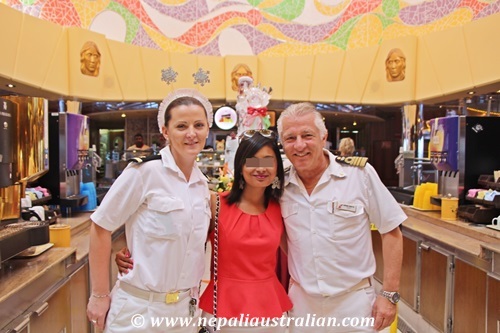 Before we had even boarded the ship, we had already decided to do the behind the scene tour on Carnival Spirit because there aren’t many times that you get an opportunity to see how the big ships are operated and cater for 3000+ guests and staffs. 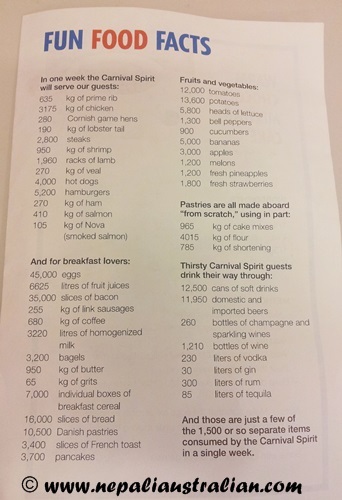 The carnival website describes it as Behind the Fun tour, which costs $95-per-person and lasts around three-and-a-half hours and which includes a visit with key shipboard officers such as the the chief engineer, chef de cuisine and also a visit with the captain on the bridge. 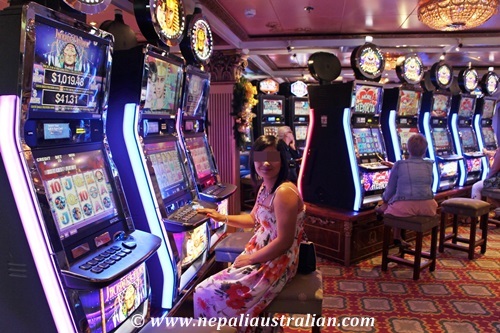 It also includes stops backstage in the main show lounge, the ship’s laundry room, crew galley and dining room, crew gym, crew training centre, the main passenger galley, the ship’s bridge and engine control room. Behind the Fun participants receive a number of commemorative gifts, including a Behind the Fun baseball cap and photos with the captain on the bridge. The capacity is limited to 16 passengers per tour, and passengers must be 13 or older to participate. We booked this tour on our first day on board and luckily got two tickets. I was a bit disappointed to know that cameras, or anything with an audio or video recording function, are not allowed as it would have been fun to take a few photos for the memory. We were asked to wear flat comfortable shoes and not to wear skirt or dress for women. Therefore, I was wearing my running shoes and short. We meet others at the meeting point , the Shanghai bar, at 8:30 am. We met our guide who checked our tickets and gave us a lanyard with a tour pass. We were asked to make a single file and we followed the guide to the theatre, our first stop. The lead dancer who was taking us around took us behind the stage where we could see hundreds of costumes, wigs, jeweleries and props. It was brightly lit and had several mirrors. He gave us an overview and then we moved on to our next stop. We exited the theater and made our way to our next stop, the photography lab. The lab was smaller than expected but I learned a few new stuffs from the manager in charge. They only have a few computers and two huge printers. She told us that thousands of photos are taken every day around the cruise. 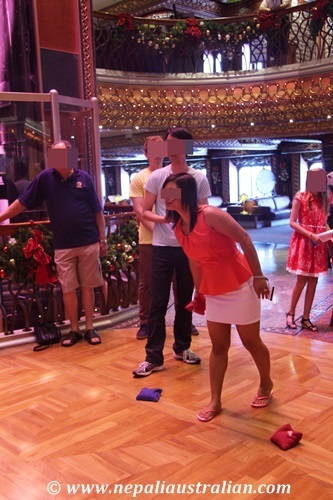 For those of you who haven’t cruised, every photo taken of you by a ship’s photographer is displayed in the gallery for the duration of the cruise. One can go and buy the photo if you like. Since photos cost between $10 and $20 each, many photos end up not being purchased. She told us that even if just 10% of the photos are sold they are happy while on this particular ship, the sale has been around 20%. Rest of the photos will be recycled. I was a bit disappointed that they didn’t give digital copies of the photos instead but they have a plan to do that in future. From there our next stop was the galley where the chefs prepare our delicious meals every day. 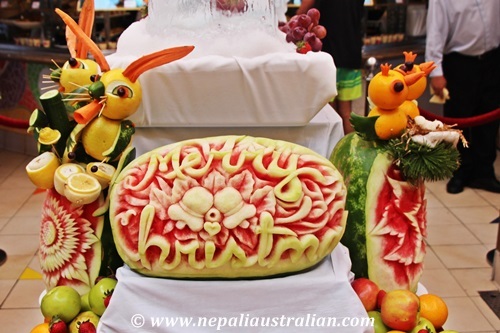 We met the head chef who explained how much food is consumed every day in the ship. Here are some fun facts that they told us during this trip. They were making chocolate covered strawberries so all of us were allowed to taste them along with some freshly baked pastries. Before we moved on to the next stop, Carnival’s photographer did take a few photos of us with the chef. 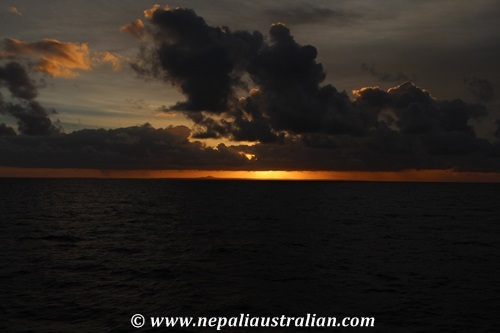 From the galley, we descended one level to our first visit to a crew deck, to the storerooms. They had big cool rooms bigger than our cabin rooms to stores everything from beer and wines to fruits and veggies for the whole tour. The guy who managed the tour told us that on their first Australian trip, they had run out of coco cola and beer the last few days and it was very disappointing. So they stock 30% more alcohol in case Aussies decided to go on a drinking spree. 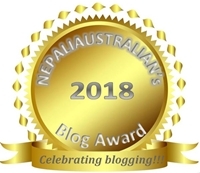 I always find it weird to hear that we, Aussies, are so much into drinking when I can see that the same thing happening everywhere in the world. From there we walked further in the corridor unofficially named I-95 (after the main highway on the East Coast of the United States). We saw crew/staff rooms, staff dining room, bar, staff computer room, staff library and other areas. The tour guide told us that all staffs must speak English in guest areas and there is language training and other education programs on board making sure crews/staffs are trained in every aspect of their job. From there we went to went to the environmental control/garbage room. The Waste Management Plant consists of two dry garbage shredders for the burnable and un-burnable waste (i.e. cartons, wood, plastic, glass and tins), which is collected from passenger/crew areas and transported to the Garbage Room at Deck A level. The unsorted waste is fed into two heavy duty high capacity shredders. One waste compactor is suitable for compacting cardboard, paper and plastic. Glass (three colours) is collected in bags or containers and stored on board for later delivery to shore side reception facilities. One tin identifier, capable of compacting 70kg of tin cans per hour is also on board as are two garbage incinerators which are automatic, multi-chamber, semi-pyrolitic marine type with an incineration capacity of 1,400kW each. I was really happy to see that they take care of the environment and recycle everything possible. After we exited the engine control room’s little corridor, we took elevators down the deck below the waterline and to the laundry room. First, we walked through the area where they cleaned and iron the passengers’ personal items. Nearby were racks of crew uniforms and everywhere were people keeping busy. The rooms were very noisy. After a few turns we gathered around the man in charge and the machines, and there were machines: the towel and sheet folders. They did a demo and asked if anyone wanted to try it. I gave it a go and it was fun :). The laundry in charge told us that the stewards keep two backups for each stateroom’s linen in their cupboards at all times. From there we were taken to HR office/training room where we rested for a while looking at photos of different areas we couldn’t go to especially the crew’s rooms as it was their only personal space. Everyone who had questions was allowed to ask and the tour guide was nice enough to answer all those questions. We left the office, backtracked a bit, and came to the crew bar where there were cookies as well as soda, juice, and coffee. I had a glass of orange juice and some cookies. After everyone was done with their food, we took the elevator and stairs to the Bridge. This part was the most exciting for me as it is the place where everything is controlled from and is the headquarter for the entire ship. We met the captain, the head of the ship. He was an Italian man who I saw smiling a lot. His name is Adriano Binacchi and he was nice and friendly. He explained the different equipments and how the ship works. The view from the bridge was amazing and I could see the crew’s deck at the front of the ship, where they have their own hot tub. Potted plants lined the big bridge. There was also a glass on one side of the floor and the view was great as you could see all the way down to the water and standing on it felt like you are standing on thin air. After this, we queued to have our photos taken with the captain and also had a group shot with him. That was the end of the tour and we were back to the Shanghai bar where we met in the morning. The tour was over 3 hours and all of us were tired. It was really thoughtful that coffee, juice, and pastries were available at the Shanghai bar when we got back. We got a goodie bag each with swans made out of soap, a bag, a lanyard and bracelet with Behind The Fun inscribed, and a baseball cap inside. 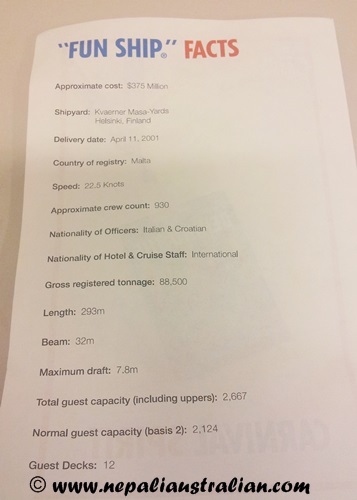 It also had a leaflet with ship statistics and a recipe for the famous chocolate melting cake. This was lovely as I didn’t know we were getting all that. Later that afternoon we also got the print of the photos we had taken with the captain and the master chef as well as a treat, a plate of chocolate covered strawberries and some freshly baked pastry. We both loved the tour as we would have not known so much about the ship for sure if we haven’t gone on the tour. Anyone who has been to one of the Carnival cruise will vouch that the warm chocolate melting cake is the best melting cake ever. 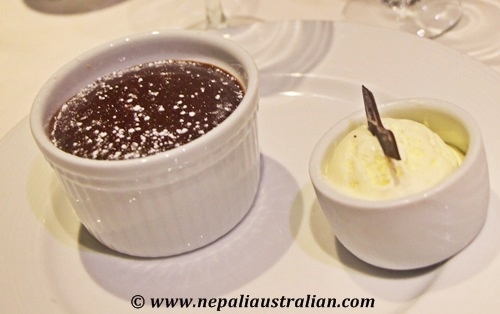 The chocolate melting cake used to be either a special order or only served on certain nights on the cruise before. 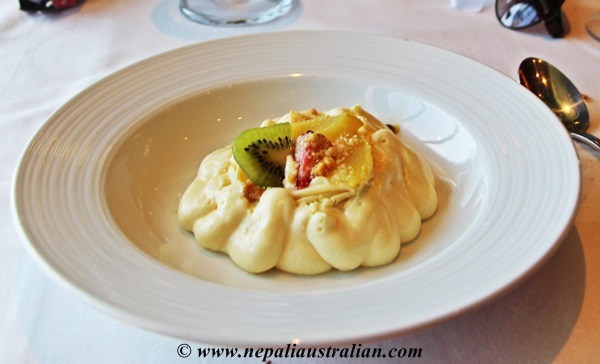 The dessert became so popular because of its richness and delicious taste that Carnival has now put it on the menu for dinner every night. Being chocoholic, of course it was AS’s favourite dessert throughout the cruise as well. Imagine our delight when we got the recipe for the cake when we were doing the behind the fun tour. Melt the chocolate and butter. Mix the eggs and sugar and whisk for few minutes and add the flour. Add the egg mix to the melted chocolate and mix. Pour the mix in a greased mold. Bake directly in the oven 200 C0 for 14 minutes. Note: Make sure that the eggs are at room temperature and chocolate is warm enough while making the mixture. 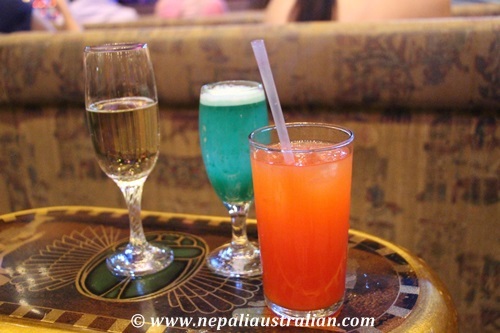 Before we even boarded the cruise, I had heard a lot about the Serenity Deck on Carnival Spirit so I was curious to find out what it looked like. Serenity is defined as the state of being calm, peaceful, and untroubled. 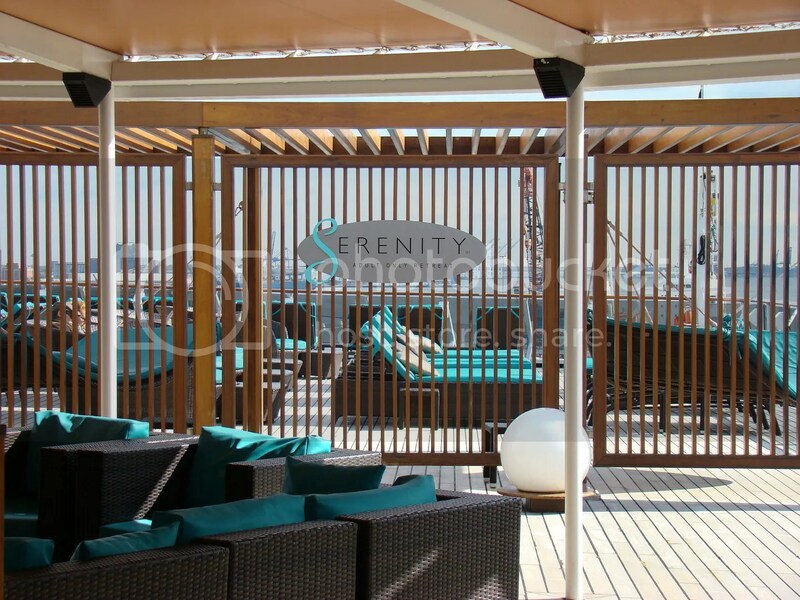 Serenity Deck is an adults only sanctuary (18yrs +), a free area to enjoy at your leisure with pods, deck chairs, hammock to lie down on and a heated spa and pool, if you want to take a dip. There is a bar where they play live music in the evening, separate towel service and waiters are always around if you want to order drinks. 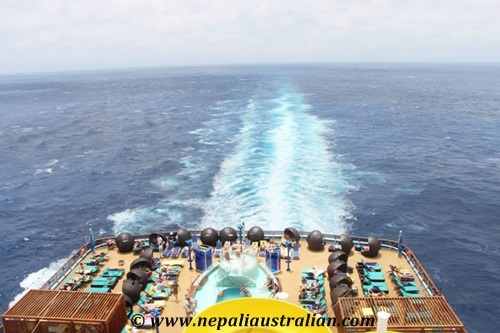 When we got on the ship on the first day we went to deck nine where Serenity Deck is and the first thing I noticed was the 270-degree view of the ocean. The pods are round bed-chairs that fit up to 3 people and looked really comfy. The huge hammocks were partially shaded. On day one there were not many people there so we thought we would give it a go another day. One of the first sea days after lunch we went around the Serenity area to see if we could get a pod but it seemed as if every adult on the ship tries to secure a spot in there, so it was quite crowded. It was a big mistake to think that we would get a space easily. It looked like parents leave the kids in kids club and hide there. I didn’t want to give up so we decided to go round again and luckily I saw a lady in one of the hammocks leaving. I waited for her to gather her stuff and we finally got the hammock. As it was a nice sunny day, the hammock was not a great idea as the sun came straight into your eyes. We relaxed there for an hour and then we moved on to do other things. 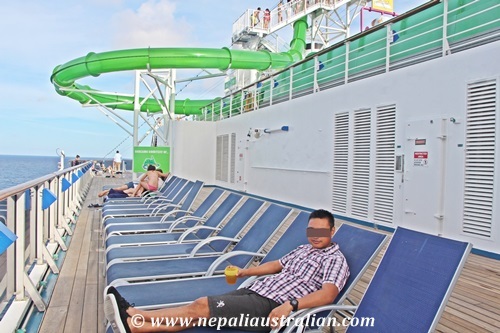 People normally came early to the Serenity Deck and left their towels to reserve their area. Even though a sign said you can’t hold the pod/hammock for more than 40 minutes there was no one enforcing it really. We definitely didn’t want to waste our energy waiting for a space as there was so much you could do in the ship. But whenever we went around the serenity area, it would be full. 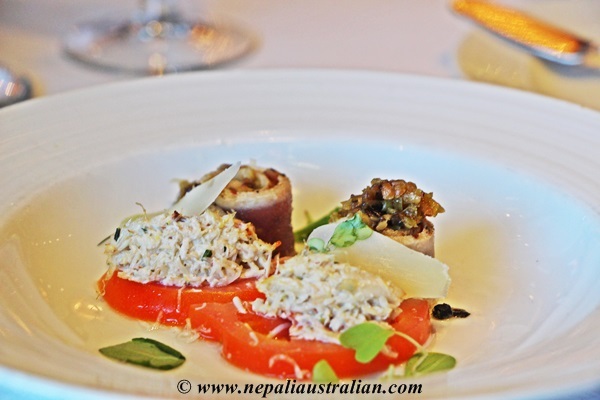 But we learned that in the evening, when the first dining sitting started, people left to go and eat so we went there just to relax for a few hours in the evenings before our dinner, for the rest of the days on board. It was the perfect time as we got to enjoy the beautiful sunsets. 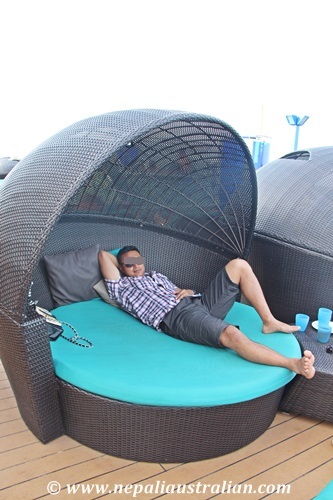 We quiet enjoyed the pods and hammocks as it was really relaxing just to watch the open ocean or sky while lying there. But at the same time I didn’t think it was worth it to spend a whole day there missing every other activity on the ship. Serenity Deck was not as quiet as it is supposed to be as people would be on the phone or with friends talking so loud that you be left wondering if they even understood what serenity meant in the first place. Anyway, for me and AS, it was a fun and relaxing time on this part of the ship. Our cruise on Carnival was advertised as a Christmas cruise so obviously I was expecting the Christmas to be special on board. 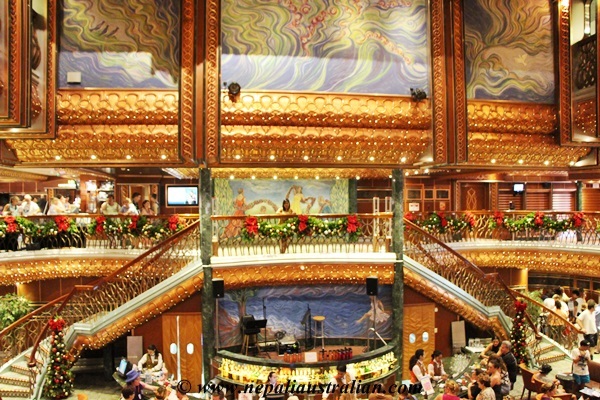 As soon as we walked onto the ship, I could see that they had beautiful Christmas decorations everywhere. It actually felt like Christmas all the time we were on board. Definitely, Christmas day was very special. We had sea day on the 25th of December so everyone was on the ship. They had announced the previous day that they were going to have special Christmas lunch so we were looking forward to that. On Christmas morning, after a quick workout at the gym, we went to the buffet area for breakfast. 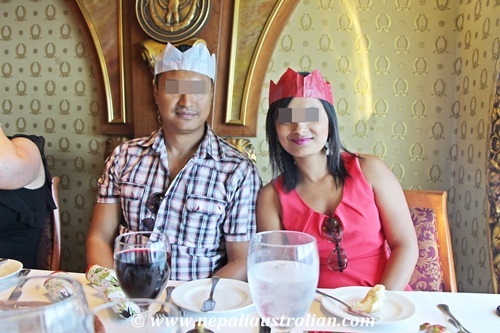 Most of the staff and some of the cruisers were already wearing Christmas hats, ties, headbands and earrings. The environment was very festive and there were tables full of families enjoying the Christmas breakfast. 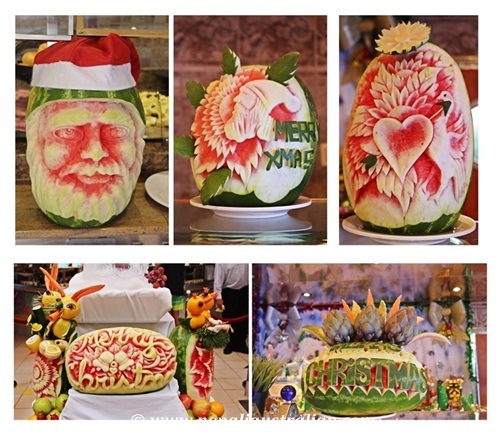 All the dining areas had watermelons craved with figurines like, Merry Christmas, Santa’s face, flowers and other the Christmas decoration. 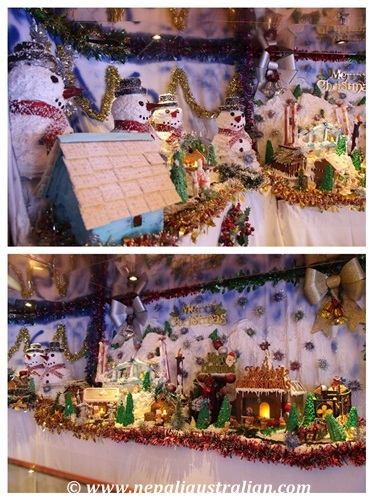 Also there was an area where they built a gingerbread house, some snowmen and it looked really pretty. We had our usual breakfast and as it was nice and fresh. When we were done with breakfast, we saw that a few staffs were craving something on a big block of ice. We went back to our room and on the way back we saw many rooms door decorated with Christmas decoration. Actually, they were giving prizes for best-decorated doors. 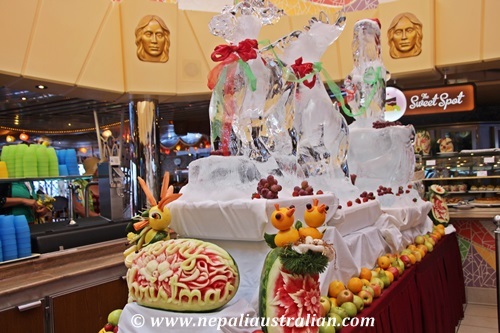 Once in the room, we had a shower and went back to the buffet area again and was surprised to see this beautiful ice carving of Santa with his reindeers and it looked absolutely amazing. The staffs on board worked really hard to make sure the ship had full Christmas vibe. The captain of the ship was walking around wishing everyone a Merry Christmas and we managed to take some photos with him too. After admiring all the decoration on that floor, we went around to find more activates. Everywhere we saw people in Santa hats and red outfits. I felt like I was in a mall somewhere, not on a ship. There were photographers capturing family photos with Santa and Christmas tree and there were families enjoying their time together. For me and AS, we didn’t want photos with Santa so we kept on roaming around until we found the hall where bean bag throwing competition was about to start. It was going to be Men Vs Women. I wanted to take part so went and had my name written down. After a few minutes, game started. 4 males vs 4 females. They gave us 4 bean bags about 10 inches square and it had to go inside a board with a small hole around 15 feet away. It was a fun game. The first few times, all my bags were either on the floor or on the board but once I got the hang of it, I scored a few points. It was entertaining for everyone watching as well but unfortunately, the male group won the game. 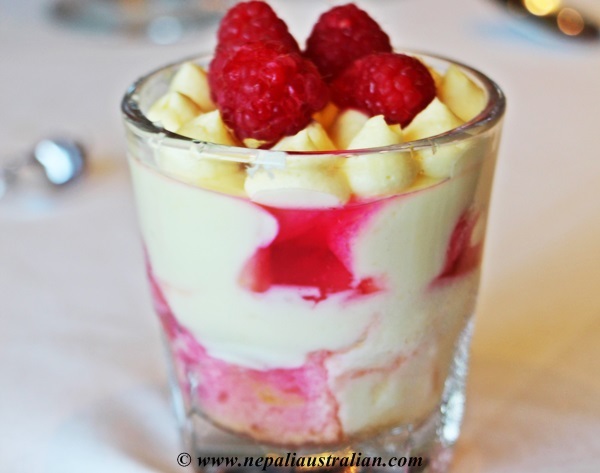 By that time, it was time for us to go to the restaurant (Empire dining room) for our Christmas lunch. 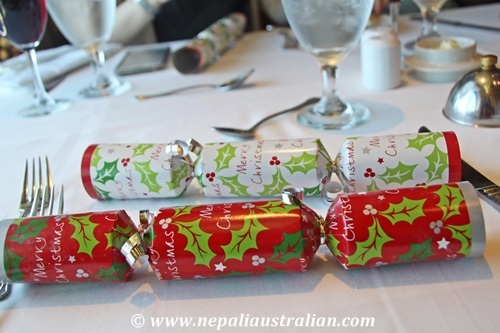 When we arrived at our table, there were already Christmas crackers on the tables and the staffs were in a festive mood wishing everyone a very Merry Christmas. Rest of the couples from our table arrived and we started the lunch. They told us that they used to have Christmas dinner before but for the first time, they were organising Christmas lunch because that is an Australian tradition and they wanted us to enjoy an Aussie Christmas. It was really thoughtful of the management and staff because it was extra hard work for them to organise the special lunch. 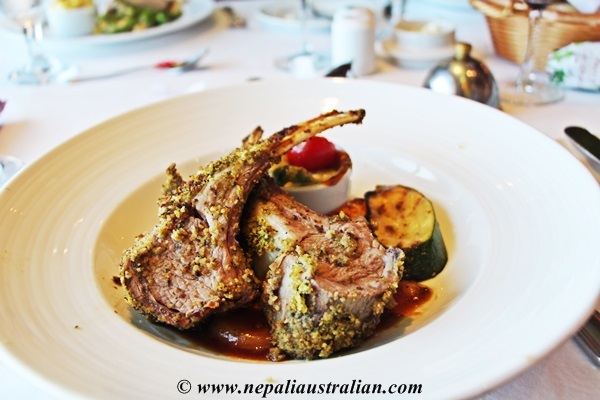 The menu was even more aussiefied with crusted lamb roast, prawns and pavlova on the menu. We loved the food and it was fun popping Christmas crackers and wearing the hat. I have to admit, they made us all feel special on the special day. After lunch, both of us were so stuffed that we went to the upper deck and just relaxed on the lounge. 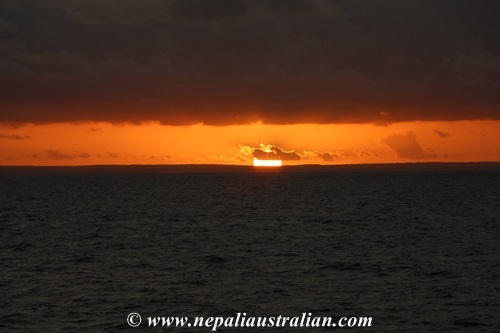 We enjoyed the beautiful sunset on the horizon before going to the room to get ready for dinner. 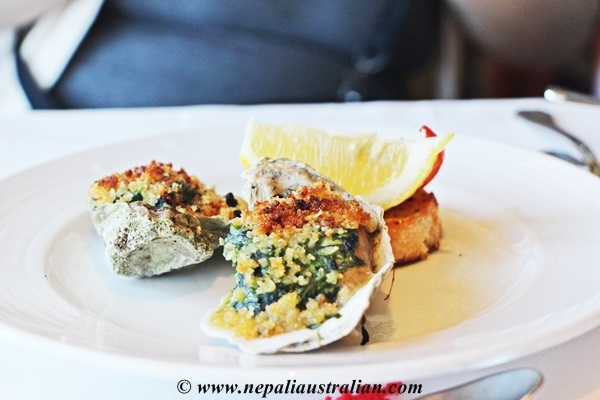 Like every day, the Empire dining room served one of the best dinners and we were happy with the service and food. 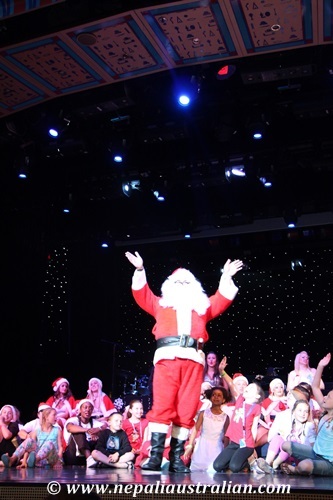 After dinner, special Christmas show was organised in the main hall (Pharaoh’s Palace) so we went there. 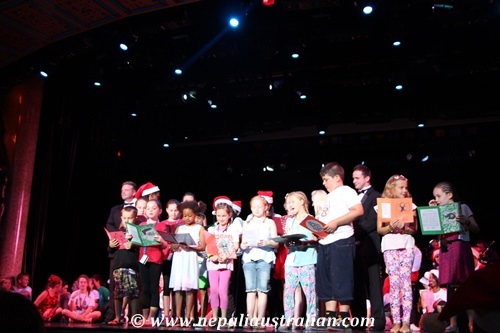 The Christmas show was fun with Christmas carols from the singers and some kids, followed by Christmas song, Christmas story and many more entertainment and of course Santa Clause. 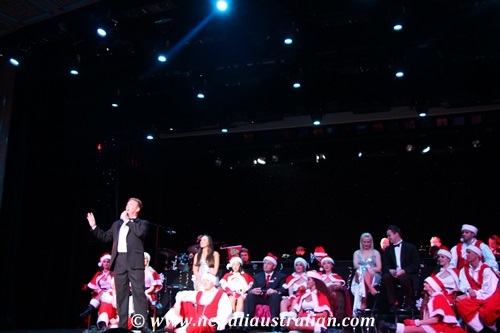 Overall, AS and I had a splendid Christmas on board Carnival Spirit. On the way to our room we had a quick stop at the casino and had some fun :). We were both tired after a while and were off too bed. Hope all of you a great one too.